Last weekend, Mid-America Christian University held its semi-annual Celebration of Culture event, highlighting Latino-Hispanic heritage with a weekend of festivities and service projects. Beginning at 10 AM on October 7, students and community members were addressed in the university chapel by local leaders like Josue Chavez of the Oklahoma City Family Church and Rev. Mark Inscoe, a teacher from Capitol Hill High School. After chapel services concluded around 11:30 AM, an inspired Latino-Hispanic lunch highlighted with traditional fare such as quesadillas, enchiladas, tres leches cake and Mexican street corn. Traditional dancers provided entertainment. After lunch, about a dozen MACU students drove to the Tony Reyes Bilingual Child Development Center, a part of the Latino Community Development Agency located in Oklahoma City. Volunteers weeded flowerbeds, mowed the lawn, cleaned up the playground area, and interacted with some of the children at the center. To cap off the festivities, MACU joined with the OKC Family Church, located at 8300 S. Santa Fe Ave. in Oklahoma City, for a bilingual worship service on October 9. Several MACU students and faculty members joined the congregation, which is composed of both English- and Spanish-speaking individuals. 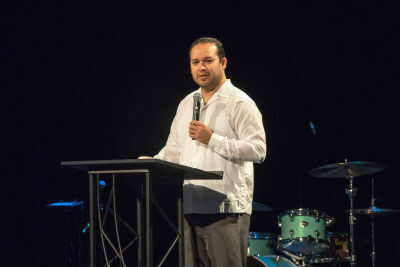 Photo: Pastor Josue Chavez speaks to the MACU community. 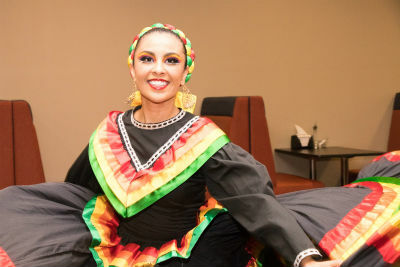 The Celebration of Culture event is a semi-annual event on the MACU campus. Every semester, MACU holds a festive chapel service to recognize and raise awareness of various cultures both locally and globally. Campus Pastor Johnny Bland said it is all part of a larger component of MACU’s diverse campus. Last year, 16 percent of MACU’s traditional students identified as being of a Hispanic heritage, accounting for about 8 percent of the university’s total enrollment between traditional and non-traditional, adult students who attend classes either on-ground or online. In addition, MACU offers a master’s of leadership entirely in Spanish and is home to the Thomas School of International Studies, a multi-dimensional center that equips individuals across many cultures to impact the world for Jesus Christ. Mid-America Christian University offers a Christian liberal arts education through two dynamic colleges. The College of Arts and Sciences (CAS) offers undergraduate degrees to traditional residential and daytime commuting students at the main campus in Oklahoma City. The College of Adult and Graduate Studies (CAGS) makes college education affordable and accessible to busy working adults and graduate students. Degree programs are offered online and convenient evening classes at the main campus, and through the north OKC location. MACU is an endorsed agency of the Church of God (Anderson, IN), and is regionally accredited by the Higher Learning Commission of the North Central Association of Colleges and Schools (NCA; www.ncahlc.org). Visit www.MACU.edu for more information. This entry was posted in All Church of God, Central, Colleges & Universities and tagged celebration, culture, heritage, Hispanic, Latino, MACU, Mid-America Christian University, multicultural, Oklahoma City, Spanish. Bookmark the permalink.